As I prepare this post, I am nearly finished reading my January TBR List poll winner (thank you again to all who voted! 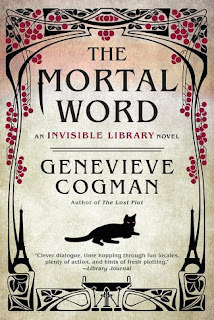 ), The Mortal Word by Genevieve Cogman, the fifth in the Invisible Library series. I hope to be finished with it by the time you are reading this post. Murder is not a promising start for a peace conference between the fae and the dragons. The neutrality of the Library may be at stake as well. Set in 1890's Paris--well, one version of it anyway--The Mortal Word is full of magic, intrigue, and more than a few twists. The braziers in the torture chamber had burned low while Irene waited for the count to arrive. The stone wall behind her back was cold, even though her layers of clothing--dirndl, blouse, apron, and shawl--and the shackles scraped her wrists. Down the corridor she could hear the sounds of the other prisoners: suppressed tears, prayers, and a mother trying to soothe her baby. Irene, Librarian extraordinaire, always seems to find herself in the direst of circumstances--or rather, that's how the reader often finds her at the beginning of the books in this series. I wonder how she will get herself out of this one! "I accept that you have--or that you believe you have--information. I am prepared to negotiate. But I'm being quite honest here when I tell you that I don't know what the information is." I am just as curious as Kai and Vale must be to know just what that information may be. And why is this person so sure Irene knows already? There is something about a physical book, isn't there? Such a small object that holds so much magic inside. I grew up surrounded by books, and have a house full now. My living room is more commonly known around here as the library. It is the first room you see when you enter my house from the front door. Bookshelves full of books. And that isn't even counting the shelves and shelves of books I have in other parts of the house. I love my physical books, being able to hold them in my hands, run my fingers through their many pages, some with beautiful artwork that doesn't compare on a screen. Signed editions. Books that hold notes of previous readers. Old and new. Lots and lots of books, full of knowledge and adventure. I only started listening to audio books a few short years ago. I had all the usual excuses you hear as to why they would not work for me. Wandering attention span, no time or fractured time (constant interruptions), drowsiness when read to, and lack of or poor accessibility to them, just to name a few. But I had not really tried, and so all those excuses were rather flimsy at best. I have since discovered that I do enjoy listening to audio books from time to time. I have learned which types of books work best for me and in that format--and discovered just how important the narrator can be. I also have learned that some of my original excuses are valid reasons for why audio books have not become a more regular staple in my reading life. So, while I do enjoy listening to books, it is not my favorite way to take in books. I like that it is an option though--there may come a time when they do fit into my life better. I never imagined I would take to e-books. I was very skeptical of them when I first heard about them. I am not sure what it was that changed my mind--no, that's not true. I do know. Convenience. It has a lot to do with convenience. Having so many books at my fingertips in one tiny device. Being able to read in the dark while my daughter is snuggled next to me, sleeping. Much easier to hold and turn pages when I only have one arm available--or even hold with no arms available. Adjustable text. And often the price tag is a bit lower than the physical copy. The reality of it is I read more e-books than physical books these days as a result. All that to say my answer to this week's question is e-books. I like that there are so many different options for reading books available to us, and I hope those options continue to grow. I do not see physical books going anywhere though, thankfully. Anne - All the books in the series so far have the main character in some dire situation. She always manages to get herself out of it. It's a great series. Thanks for visiting! I love your BBH answer. I do like audiobooks, but my mind gets too distracted by other things and I end up not listening to the story. I would rather have a physical book in my hands, but if printed books were no longer a thing, then I guess I would go with eBooks. Your "Friday 56" looks like an interesting read! Billy - I have that problem too. My mind is always so busy and sometimes even an audiobook cannot focus me enough to keep my mind from wandering. It depends on the audiobook really. Thank you for stopping by! I read The Mortal Word a while ago and enjoyed it. Breana - I really enjoyed it too! Thank you for visiting! I love ebooks but I don't think actual physical books will ever go away which I'm very happy about. Nicci - Me too! I like my physical books too much. Thank you for stopping by! It's a funny thing - I never would have thought that I would actually read so few books in print format. However, I'm not sure I could have imagined e-books when I was reading so long ago. For me now, though I love to see books on a shelf, I use my Kindle much more and I also listen to a LOT of books. If I had to pick, I'd say e-books. I still love running my eyes over the words. And, as you said, narrator is important. Hopefully, we'll continue to have all the choices for each of us. Kay - I think there's room for all formats, and they all have their advantages. I love seeing books on my shelves too. And while I have grown dependent on my e-reader, I still enjoy reading physical books. I don't see that changing. I do think audiobooks will play a larger role in my future. Maybe when my life shifts a bit and Mouse is older. Thanks for visiting! Jenclair - There is seething to be said for traveling lighter with an e-reader. Thank you for stopping by! Stephanie - I had to experiment with different types of audiobooks to figure out which ones work best for me. A wandering mind is my biggest problem, otherwise. I do enjoy audiobooks when cleaning house or on long drives. I also really like music, so it depends on my mood. E-Books are much more upy alley. Thank you for visiting! I have probably mentioned this before, but this is a series I really want to start. Catherine - You must! I think you'd like it. :-) Thank you for stopping by! I also came to e-books reluctantly. In 2010, my daughter gave me my first Kindle, so I reluctantly tried them. Now, three Kindles later, I am sold. I do love to hold a book in my hand, and still buy hardcover books, mostly memoirs with photos. Laurel-Rain - I've had several e-readers over the years too. I just love my Oasis. Thank you for visiting! I hope you have a great week too. I've begun this series but haven't had a chance to read more than the first book. 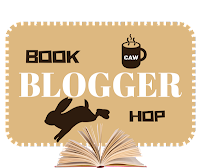 I'm featuring The Military Wife by Laura Trentham from my review stack this week. Happy reading! Kathy - I really enjoy the series. I hope you are able to catch up soon. I know how that can be though ... I'm behind on so many series. Thank you for stopping by! I recently went to a writing class and the instructor told us that seeing the printed word on the page was important to developing an understanding of grammar, punctuation, etc. for our own writing. So, if I had to choose, it would be ebooks. Roberta - I can see how that would be true. Reading and listening are two very different skill sets, and I imagine writing is more closely aligned with reading in many respects. Thank you for visiting! E-books are very convenient, but I still prefer real books. :) Right now I'm in the middle of one called Robopocalypse. Have a great weekend! Lark - Nothing can beat physical books in the end. :-) Thanks for stopping by! The title sure caught my attention. As did the gorgeous cover. I wonder what she might be needing protection from. Laura - I love the title and cover too. Thanks for visiting! Had to fix your link, it didn't work. Works now though. Books sounds alright. Happy weekend! Freda - Thank you for doing that for me! Have a great week too. I'm not "reading" reading yet, for fun. Most of my reading is research lately, or nonfiction of one thing or another. I'm REALLY missing getting absorbed by a good book and have SO many waiting! I adore physical books for all the reasons you mentioned, and I love being surrounded by them, though I wish I had more good shelves set up. Occasionally I've thought a kindle would be better in bed, especially since I busted my wrist. Everything's gotten more difficult, but I won't give in simply because I spend SO much time reading from a digital screen through the day and you're supposed to be staying away from all that for 2 hours before you go to sleep. I'm thinking a kindle or nook would be the same type light :/ BUT IF I HAD to choose, I'd definitely choose ebooks over audio. I don't absorb the words in the same way because my mind drifts when I listen. I want to read actual words. I'm in love with words :) And I agree with you 100% on the narrator. It's why I don't think of trying again because of previous disappointment. I would have to try out narrators before assuming I'd enjoy it. Donna Marie - The Kindle Paperwhite and Oasis make reading in the dark easier on the eyes than your average tablet. I have a Kindle Fire which I don't like to read on if I can help it because of the way the lighting is. That one hurts my eyes after awhile. I'm not one who follows the no screen time before bed rule. And doubt I'll start any time soon no matter what the scientists say. I'm with you in loving words. Although I do enjoy audiobooks, I know I retain more when I'm reading rather than just listening. Weirdly I listen to a lot of podcasts, but audiobooks don't really work for me. I've had one I've been meaning to listen to for like 4 years!! Laina - My husband is into podcasts, but I haven't taken to them myself too well. Thanks for visiting! I hope you have a great week too. Thank you for stopping by! I keep hearing about this series. I will have to check it out. Nicki - I hope you like the series if you do. Thank you for visiting! I've always been curious about this series. I hope you enjoy this one and that you have a great weekend! Alicia - Thank you! It was good. I highly recommend the series if you get the chance to read it. Thank you for stopping by! Audio books or e-books is a tough one. I do love audio books but am picky about the narrator. I haven't embraced e-books yet, though. Kathy - I wish audiobooks worked better for me, but at least I know I generally enjoy them. It's a start! Thank you for visiting! Sounds like a good book! Have a great weekend! Yvonne - It was! Thank you for stopping by! Melody - I had to try several different types of books in audio format before discovering which worked best for me. I know it's not a format that works well for everyone. I still struggle with it sometimes. Hence my low numbers in that regard. Thank you for visiting! I chose ebooks too. I love audio books but I could do without them if needed. I don't think I could do without actually reading. I'm hoping to read The Invisible Library this year. I've owned it forever but have never gotten around to reading it. This whole series sounds wonderful. Katherine - I hope you enjoy The Invisible Library when you get to it. It's a favorite series of mine. Thank you for stopping by! It took me a while to get into ebooks and much longer to get into audiobooks. Just last year, I finally got the hang of audiobooks. I appreciate that I can have access to both but still prefer a "real" book I can hold in my hands and flip pages easily. Especially if there is a large cast of characters or different time frames, then I find it much easier to read when I have the physical book in my hands. Agreed on the convenience of ebooks. When I buy a book, it's almost always physical because I love having something tangible, but when I borrow, it's almost always an ebook. Especially since I can borrow ebooks anytime and anywhere (as long as I have internet) but can only borrow a physcial books when I go to the library.